"This is one of the most flavorful and moist salmon recipes I have ever tasted." Preheat oven to 350 degrees F (175 degrees C). Put two large squares of aluminum foil onto a large, flat work surface. Make a bed of lemon slices in the center of each foil square; top with red onion. 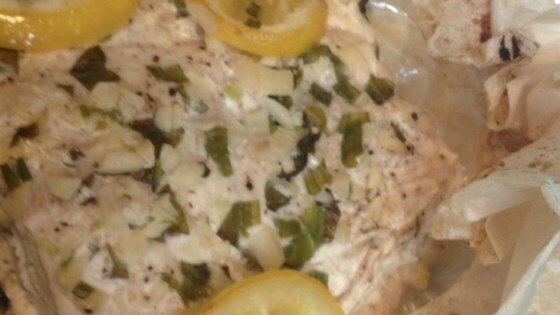 Lay a salmon fillet atop each pile of lemon slices and onion; season with basil, dill, and sea salt. Fold edges of the aluminum foil over the salmon and seal completely. Bake in the preheated oven until the fish flakes easily with a fork, about 25 minutes. Remove salmon from foil pouch, place on plate, and drizzle juices from foil pouch over the fish. See a straightforward, 5-star recipe for making baked salmon. Do not poke holes in foil pouch, even when checking salmon for doneness. The nutrition data for this recipe includes the full amount of the onion and lemon slices, though the actual amount consumed will vary. Love this recipe only I didn't have any dill so I use fresh basil instead. Very lovely. I never changed a thing but I should have. Easy, diet friendly, and very, very good. Love this salmon recipe. I didn't use onion, but the rest of the recipe was very good and very easy. Not even much cleanup. This one goes in my current recipe file. We quite liked it. I didn't have red onion so used a shallot. I didn't have fresh basil or dill so used basil pesto and dried dill. I cooked it in a covered corningware casserole. Good. I used wild caught Alaska Sockeye Salmon, and 25 minutes was not enough; it took 50 minutes for the fish too cook. It was good when it was done, though!